You don't need to leave shoe laces tied the way the shop laced them for you. 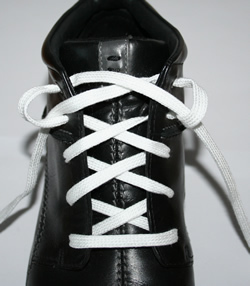 There are lots of different ways of tying a shoe lace. Altering the lacing pattern can make a big difference to how a shoe feels. 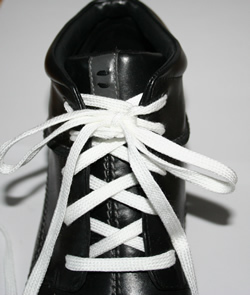 If you have heel slippage use a lock loop at the last eyelet hole. This will help to stop the heel rubbing. Tie into a bow as normal. You will find you can tighten the top around the ankle without it pulling the rest of the lace tight. 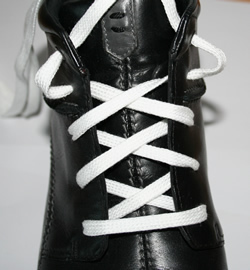 See my blog for more shoe lacing tips. Note: You might need to try a different approach to your shoe lace problem than that listed above. 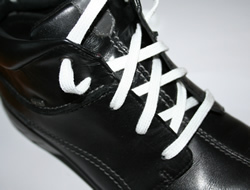 Lock Laces - an option if you want a quick solution when running or if you find tying shoe laces difficult.